Doesn’t work under OS X. Sad bug for otherwise perfect player. all works. Under OSx too. Doesn’t work under Windows 7 and VLC v2.2.1 for me. When I try to click on ‘Universal Plug’n’Play’ item on list program do nothing. I found that same thing. HOWEVER, if you load “Windows Media Player” and then go back to VLC, miraculously it works. In otherwords loading up Windows Media Player makes VLC work for me. Very strange indeed. It works under OS X but as said, it is incredibly – and I mean really incredibly – slow. The unexplained thing is that under iOS (once the server has been found which can occasionally be hit and miss) it is beautifully rapid. I have been experiencing this very same issue! I can stream files over 8Gb in size on my iPhone with no hiccups, super fast start: the works. But back on my iMac, it just seems like I’m using a 10 year old PC. Have only got small MP4s to play, but the large MKVs won’t even start. It’s driving me mad. 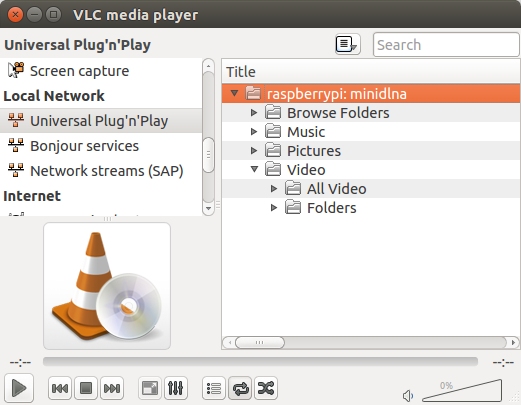 VLC v2.2.2 on Lubuntu v16.04 does not show the two DLNA servers or their files that are on my LAN. However my Win 10 PCs File Explorer shows them (and plays the video files)! What do I need to fix to make it work? Is there a way how I can turn VLC into a receiver. So that I can cast from my phone to the computer? I am already casting from my phone to some speaker. I want to continue the playback on the computer. I am yet to find a way to do so without installing additional software.